Written by Janet Choi on January 31, 2018 . 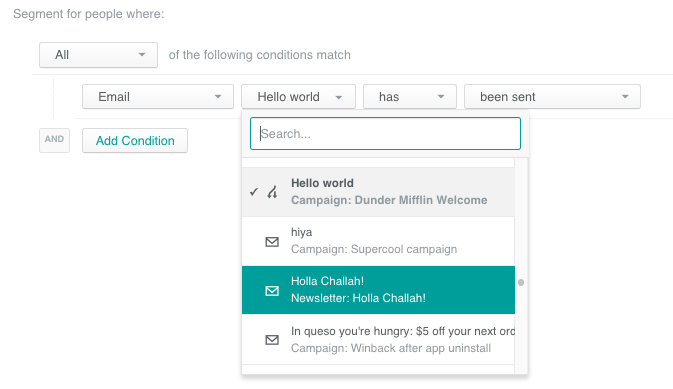 We introduced a brand new triggered campaign type: API Triggered Broadcasts! Automatically send one message to many people in response to an API call — great for recurring messages that have a similar structure but where you’d want to fill in different, up-to-the-moment data. Have you set up time windows on your conversion goals yet? Segment-building just got easier with our new “between” conditions. Now you can segment for an attribute that is a timestamp between or is between two values. Instead of having to create two separate conditions and sometimes having to do confusing time travel calculations, now you can define a simple rule in one go. The new is a timestamp between condition also gives you more control over specifying the date and time. Use is a timestamp between to create a segment of people who signed up in a specific month, for example. Or use the is between to create a segment of customers who gave you an NPS score between 7 and 10. We heard you loud and clear! 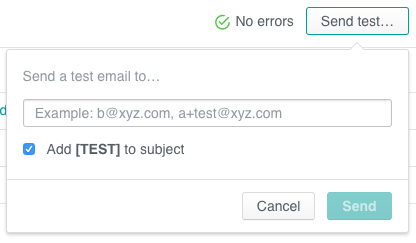 Adding [TEST] to your test email subject line is now optional. Use our super handy keyboard shortcut CTRL + K shortcut to insert or modify a hyperlink. When creating a segmentation rule based on email activity, you’ll see each email’s associated campaign name. Much easier to find the right one! We added the re-enterable campaign icon to the Journeys view. As part of our continual effort to be more helpful in the app, we’ve improved our error presentation. You’ll see this during Twilio setup and dynamic (as-you-type) validation on forms in your SMTP settings. On our Review campaign page, error messages are now more informative and will link you back to where you can fix them. We’ll remind you to save (or discard) changes when navigating between Newsletter setup pages. Retrying failed deliveries is more straightforward. While you can no longer edit failed deliveries, you’ll see a “Retry” button instead of an “Edit” button. [Filters] will be checked after any delay or time window, unless you specify otherwise in your exit conditions. Sample data for Anonymous events now looks much nicer and more in line with sample data for people. Fixed a bug where some time zone offsets were calculated incorrectly when using the Liquid timezone filter. When links were copied and pasted between emails, URLs were broken! Fixed! Custom email headers now have leading and tailing whitespace stripped; this bug caused a newsletter to send without a subject line. Moving an action between two time elements (delays or time windows) in segment triggered campaigns now works as it should. When adding attribute data that contained parentheses, the Liquid code would be incorrect. Fixed! Our delivery renderer was behaving in such a way that some deliveries got a mysterious, unhelpful failure message: “can’t modify frozen String”. We persuaded it to behave nicely.